My son Donovan is almost 7 and he picked out a Bumblebee costume last year that we got on sale after halloween. 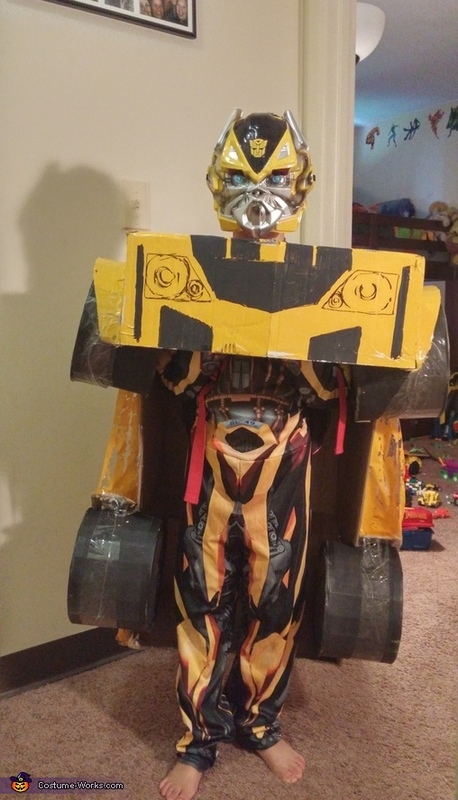 I seen an optimus prime costume on YouTube last year that transformed and thought it was amazing. I brought up the idea to my boyfriend since he's the artist and if anyone could do it he would be the one. My son of course was all for it and excited. I got boxes from a friend's job, spray paint from Wal-Mart, packing tape and started the process. My dad and I did the tires also out of boxes and my boyfriend did the whole car it took about a month some issues here and there but finally came together the day before halloween. He was a huge hit at the trick or treat at our local mall Friday night and halloween night as well. Every time someone complimented on his costume be had to make sure he told everyone he could transform and if they wanted to see. Had quite a few people asking if they could take pictures and videos as well. Thank you and hope everyone has a spooktacular halloween.